Bell Burnell in 1968 at the Mullard Radio Astronomy Observatory at Cambridge University. In 1967, Jocelyn Bell Burnell was a graduate student at Cambridge, working on a dissertation about strange objects in distant galaxies known as quasars. 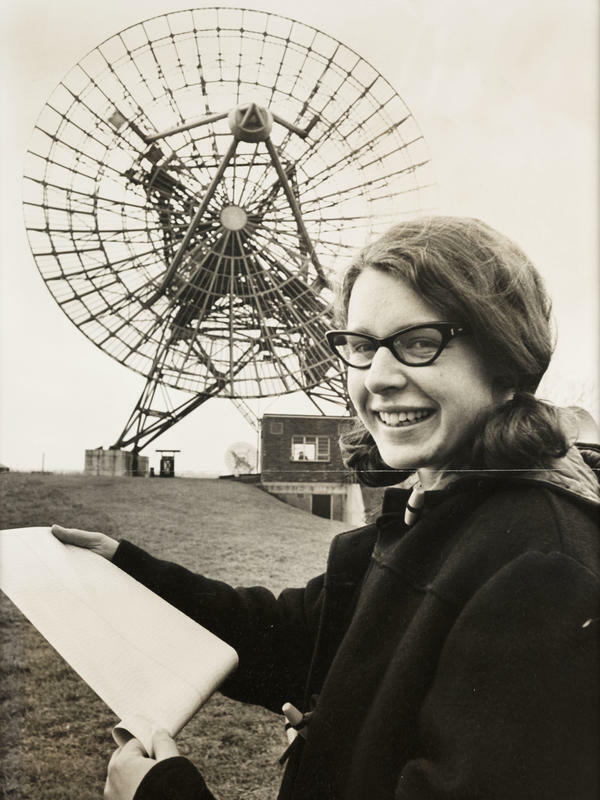 She and her supervisor, Antony Hewish, had built a radio telescope to observe them. Data from the telescope scrolled out from a machine — a line in red ink, scrawling across 96 feet of chart paper each day. As she pored over the data, she noticed something strange: "an unclassifiable squiggle," she recalls. It indicated mysterious radio waves, pulsing repeatedly. She says she noticed the unusual signal only because she suffered from impostor syndrome: the idea that you're not good enough and at any moment, you may be discovered as a fraud. For Bell Burnell, it manifested as a fear she would be tossed out of Cambridge, she told The Guardian. So she took more data from the telescope and kept scouring — but the blip vanished. A month later, the signal returned. Bell Burnell brought the results to Hewish. "He said, 'That settles it, it's manmade, it's artificial radio interference,'" she recounted to the newspaper. But she knew it couldn't be interference: The radio waves were coming from something moving at the same speed as the stars — meaning the source of the pulses had to be in space. The dense objects responsible for the squiggles are now known as pulsars – rapidly spinning neutron stars that emit radiation. Their observation is considered one of the one of the greatest astronomical discoveries of the 20th century. "The excitement was because this was a totally unexpected, totally new kind of object, behaving in a way that astronomers had never expected, never dreamt of," she said in a 2010 BBC documentary. The discovery of pulsars was so important that it won a 1974 Nobel Prize – for Hewish. Bell Burnell has said it doesn't bother her much that she wasn't included. "[I]n those days students weren't recognized by the committee," she said in 2009. Fifty years after Bell Burnell noticed that blip in the red ink, her observation has earned her a very big award: a Special Breakthrough Prize in Fundamental Physics, which comes with a check for $3 million. The Breakthrough Prizes, funded by Silicon Valley figures including Sergey Brin, Yuri Milner, and Priscilla Chan and Mark Zuckerberg, are the largest monetary science prizes in the world. "Jocelyn Bell Burnell's discovery of pulsars will always stand as one of the great surprises in the history of astronomy," Edward Witten, the chair of the committee, said in a statement. "Until that moment, no one had any real idea how neutron stars could be observed, if indeed they existed. Suddenly it turned out that nature has provided an incredibly precise way to observe these objects, something that has led to many later advances." Previous winners of the prize include Stephen Hawking, scientists at CERN involved in the discovery of the Higgs boson, and physicists in the LIGO collaboration who detected gravitational waves. Bell Burnell is donating her prize winnings to the U.K.'s Institute of Physics, where they will fund graduate scholarships for people from under-represented groups to study physics. "I don't want or need the money myself and it seemed to me that this was perhaps the best use I could put to it," she told the BBC, adding that she wants to use the money to counter the "unconscious bias" that she says happens in physics research jobs. The astrophysicist noted there has been an upside to the Nobel snub all those years ago. "I feel I've done very well out of not getting a Nobel prize," she told the Guardian. "If you get a Nobel prize you have this fantastic week and then nobody gives you anything else. If you don't get a Nobel prize you get everything that moves. Almost every year there's been some sort of party because I've got another award. That's much more fun."